Car window flags are the perfect way to demonstrate your American patriotism and pride as you travel through your neighborhood and around town. 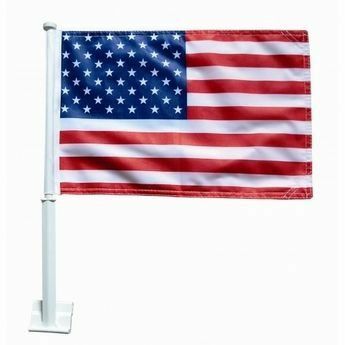 AmericanFlags.com carries two models of car flags designed to fit within any budget. Our car flags are among the best you can buy, however, they are designed for short-term use during parades, festivals or during holiday celebrations. Two key factors in your flag's life is the speed at which you operate your car with your flag attached and the weather conditions outside. High winds, rain and direct sunlight can impact the coloring and fabric. Car Dealers: Check out our discounts for large quantities!